After six weeks in Italy there were mixed emotions as we crossed the border heading north. 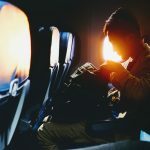 We had become used to Italy and knew what to expect, and now we were venturing into the unknown again. But oh, how exciting it was to be finally in Austria! 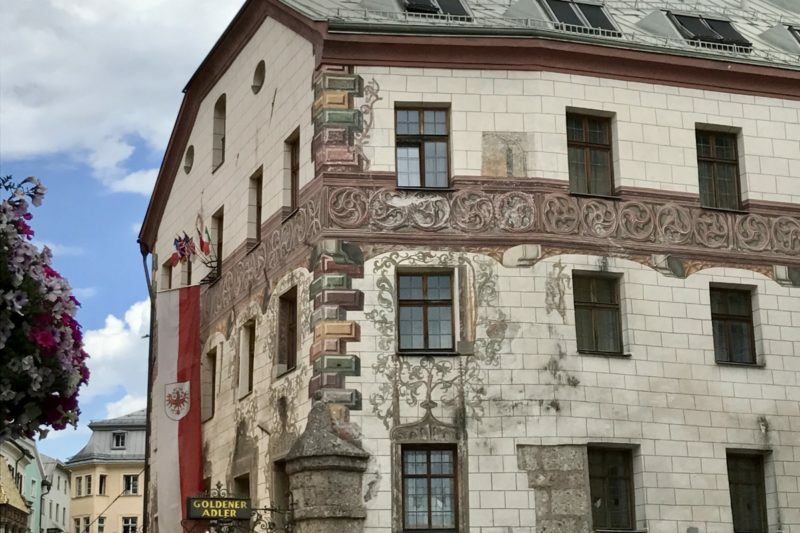 Austria was always on the list of countries we would definitely get to on this trip. 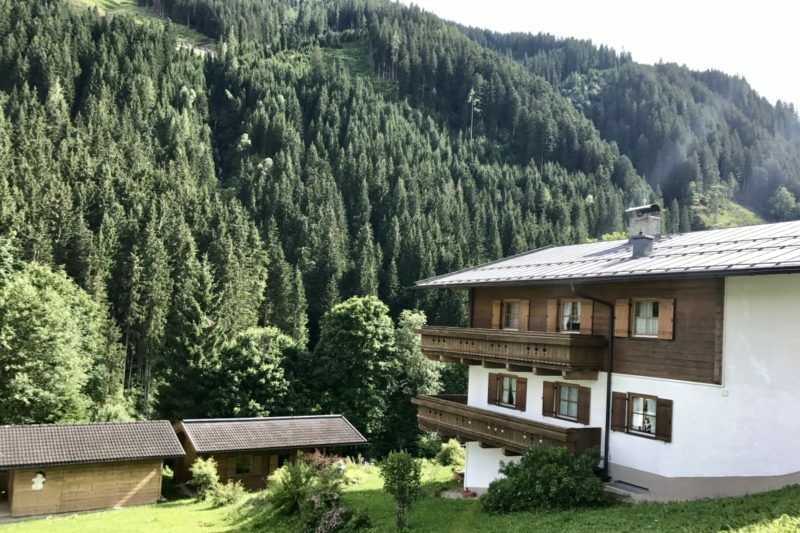 My cousin Emma owns an apartment in the Austrian Alps and we had planned to meet up here. First though, was Innsbruck. 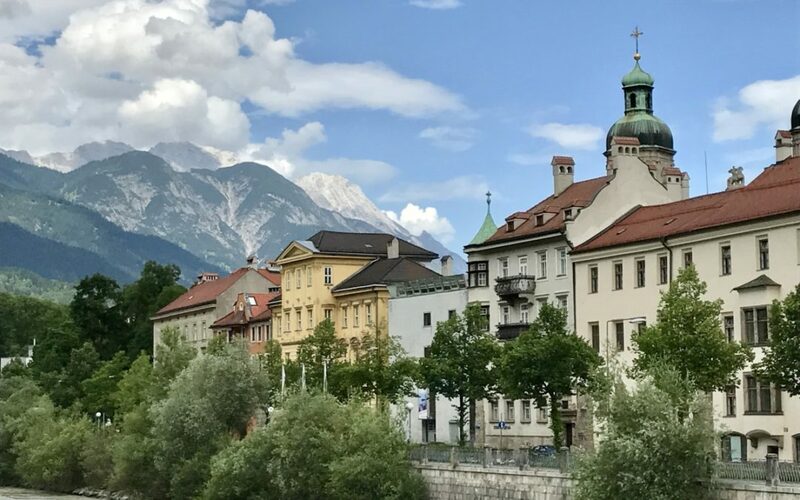 We arrived in Innsbruck early afternoon and were immediately relieved to find the temperatures had dropped to a level where it was a perfect summer afternoon. We were only here for two nights, so we wanted to make the most of the afternoon. The streets of the old town beckoned. We spent the next few hours ambling up and downs the streets, going from one cute building to the next. If the buildings weren’t enough, in between them were the towering mountains. It was all just breathtaking. 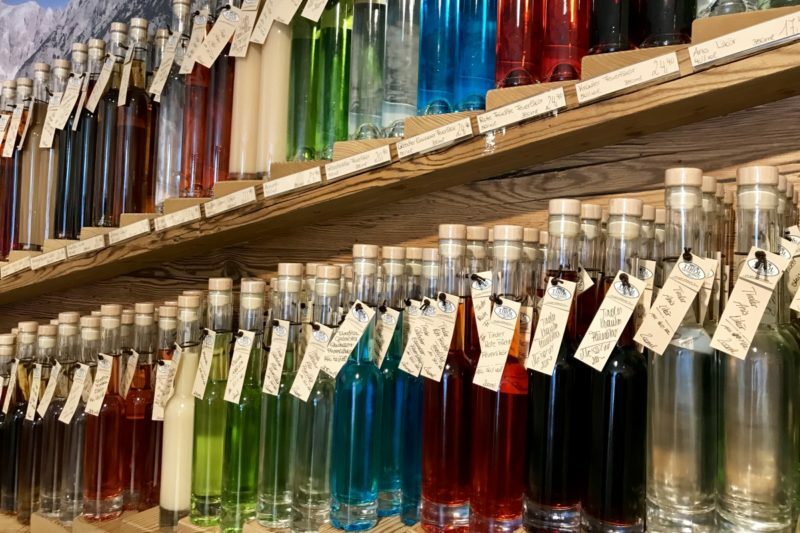 Schapps of every colour! They almost look too good to drink. 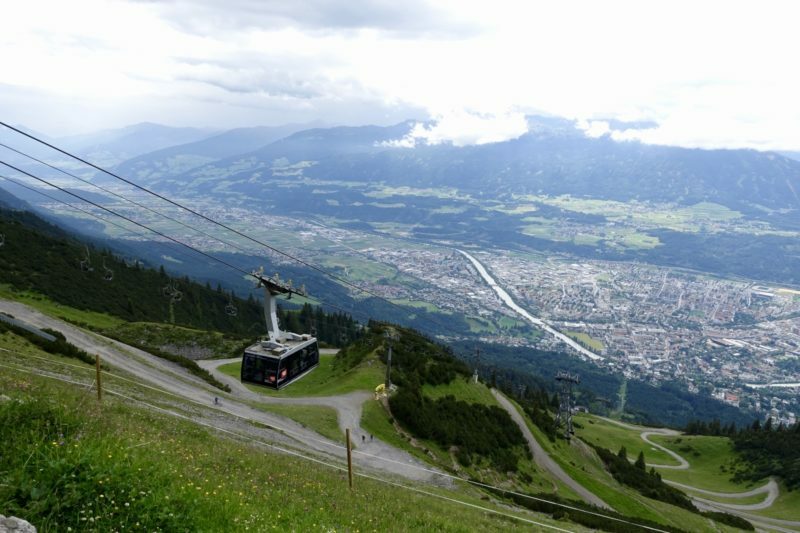 We couldn’t help but jump on the Nordkette funicular up to Hungerburg to have a look at the stunning view over Innsbruck. It leaves from right in the centre of town and only 10 minutes later you are up at 868m above sea level, admiring the view. We were enjoying the view and trying to decide if we should go up even higher. “I know that accent!” came from the man next to us and we began chatting to another Australian couple. They were on their way to the top, and mentioned to us that the journey was free with the Innsbruck Card. 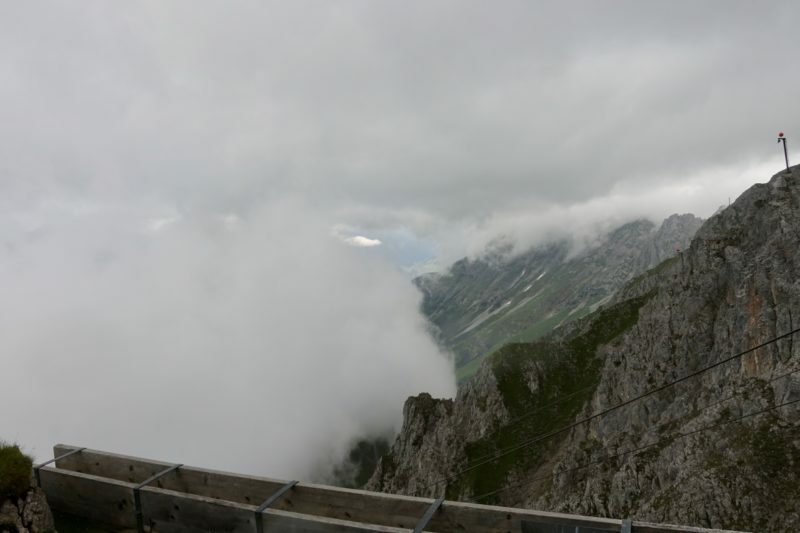 The clouds were coming over, and with the €25 fee each on top of what we had already paid, we decided to not go further right then, but rather take a look at the Innsbruck Card on our return, and see if it made sense for the following day. Hopefully the weather would be better. The funicular that goes up to Hungerburg. 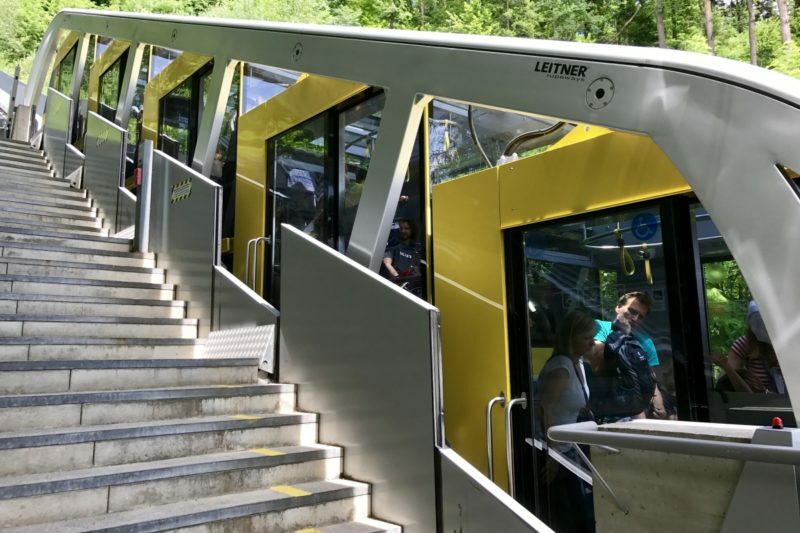 The pods tilt so the passengers are always standing on level ground no matter how steep the incline. 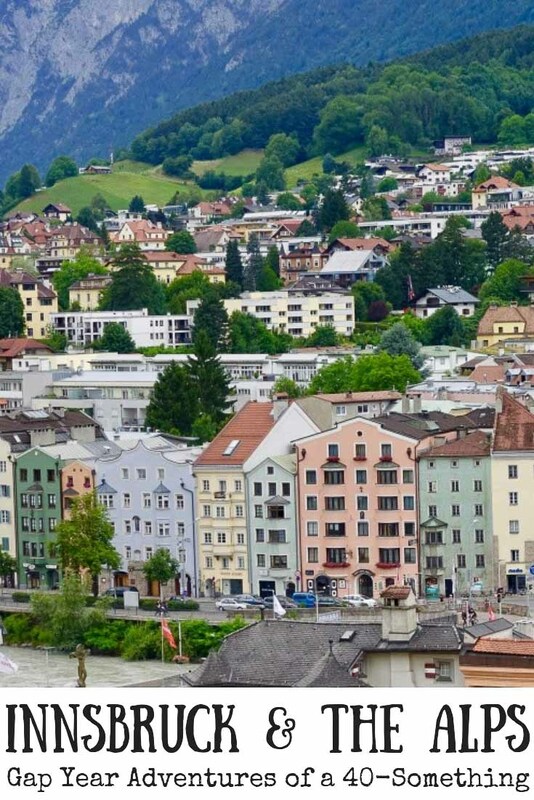 Innsbruck feels like a small town. 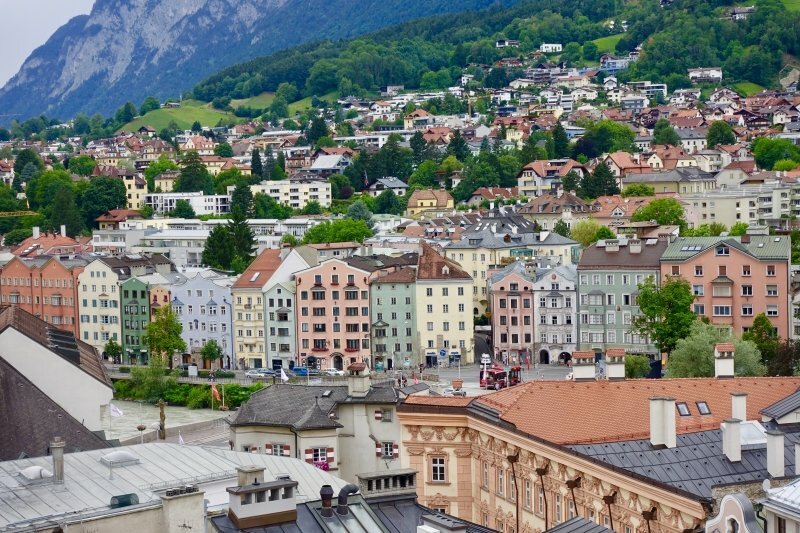 It’s not really, with a population of 125,000 but the centre of Innsbruck feels peaceful and relaxed. The only exception is the one or two most popular streets in the old town which are swamped with tour groups and other tourists. For our first night in Austria there really was only one possible meal – Schnitzel! Unlike the pub schnitty we love in Australia, the most common schnitzel here is made from pork. It was crispy and tasty, and could be found at pretty much every restaurant in Innsbruck. The Innsbruck Card ended up being a no-brainer. It costs €39 for a 24 hour card, and going to the top of the mountain was worth €33 alone. We felt sure we could do enough for the rest of the day to make this well worth the money. It’s a 24 hour card, so to make the most of it we were up nice and early the next morning, heading up the mountain again. 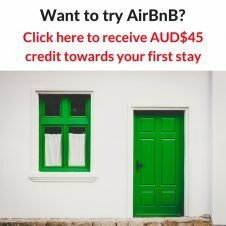 There are four places that you can visit on the way up the mountain. 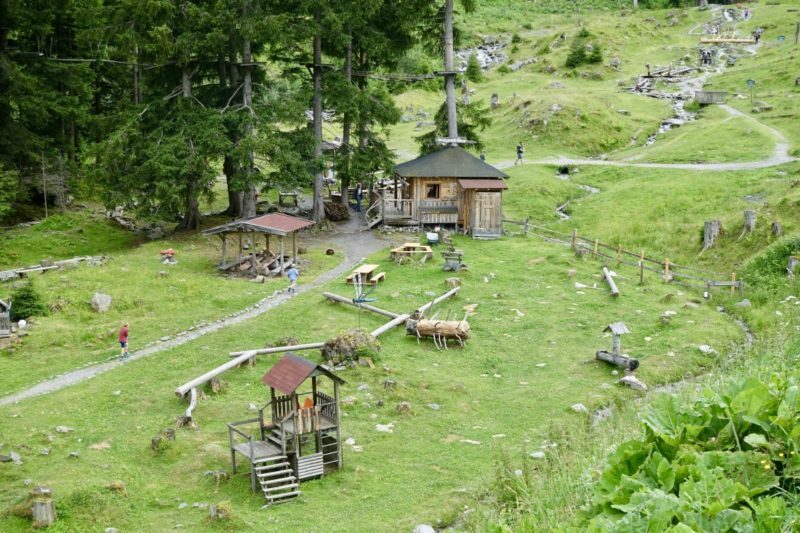 The first stop is the Innsbruck Alpine Zoo, and next is Hungerburg where we had stopped the day before. Hungerburg is a small town, and there are some nice little cafes here where visitors can grab a coffee or a snack. There is a small church to visit, or this can be the starting point for hikes or bike rides up and down the mountain. Here the first funicular stops, and to go higher we transferred to a second, smaller gondola for the next section up the mountain. On the way up we had a great view of the path below, where there were hikers and mountain bikers testing out their legs. 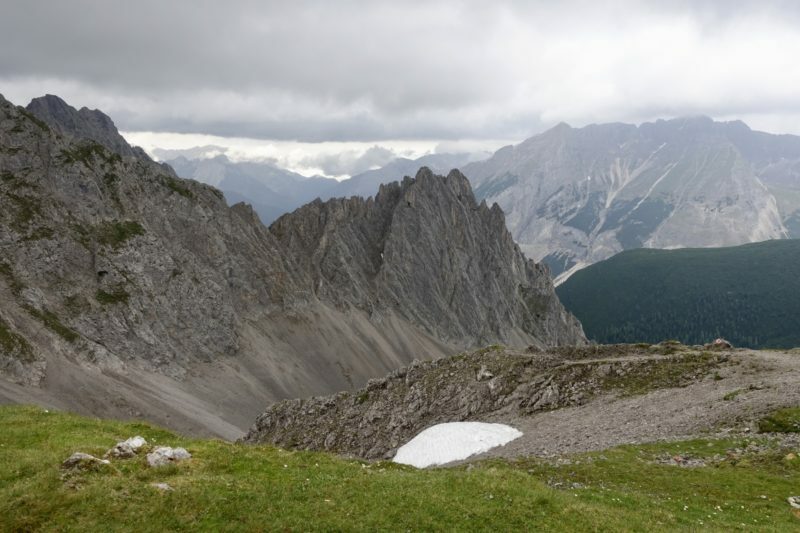 It would be a stunning hike, particularly going down rather than up, but the weather was a bit iffy and I was surprised to see dozens of people still out doing a walk that would easily take a couple of hours. On arrival at the third stop, Seegrube, we transferred immediately to the final gondola to go up the stretch to Hafelekar. We were now at over 2300m. In the porch area everyone was putting on jackets and gloves before making their way outside. Surely it couldn’t be that bad? Well, it was blowing a gale, and after a few photographs of the view, the rain started. I at least had a jacket with me, Simon was only in a t-shirt. We ducked back inside, and a short time later the rain stopped and we braved the outdoors again. The views were spectacular! We were up above most of the clouds now gathering. My extremities were freezing, but I couldn’t drag myself away from gazing into the mountains. Many of the other visitors were hiking up to an even higher point, but Simon soon went back inside while I stayed close by but admiring the view in all directions. The rain began again, and I made my way back towards the warmth. Just as I was about to go inside, I got this amazing view of cloud making its way up the mountain side until I was enveloped. For someone not used to any kind of mountains, this was all just a fantastic experience – even if my fingers were about to fall off. On the way down we stopped at Seegrube. Here there is a cafe for visitors, so we grabbed a coffee to warm up. We went out and walked around the area when the rain had slowed to a drizzle. 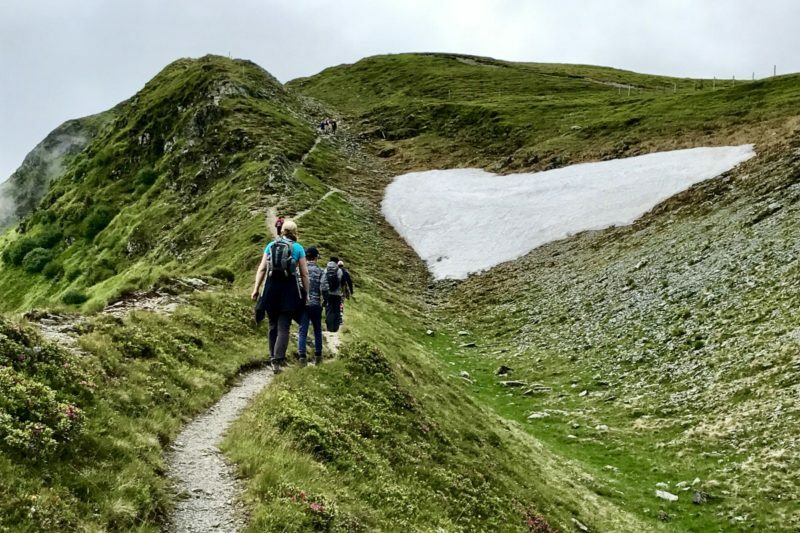 There were still patches of snow – yes, even in June – so we made our way over as I just had to stand on it. Possibly the deepest snow my feet have ever been in! I could have stayed up here all day, but we had other things to see, so started our trip back down the mountain. The view down over Innsbruck from Seegrube with the Gondola used fro the second leg. The view must be amazing on a clear day. 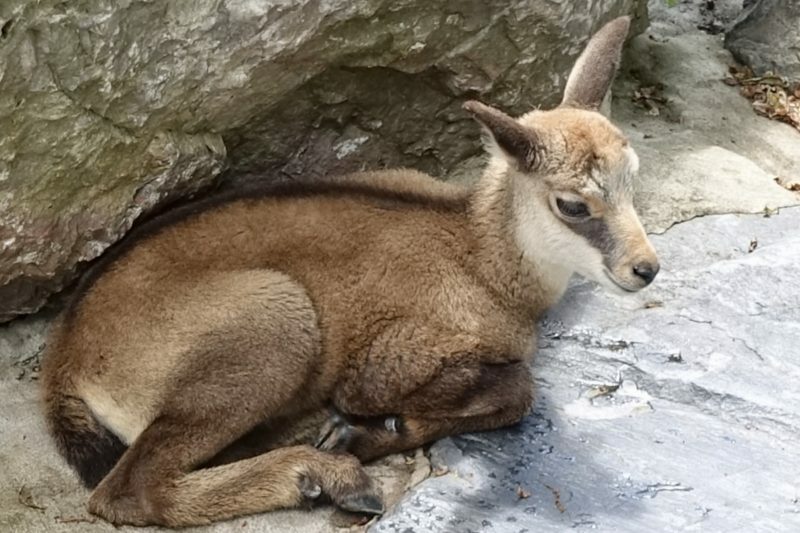 We only went down as far as the Innsbruck Alpine Zoo. Entry was free with the Innsbruck Card. 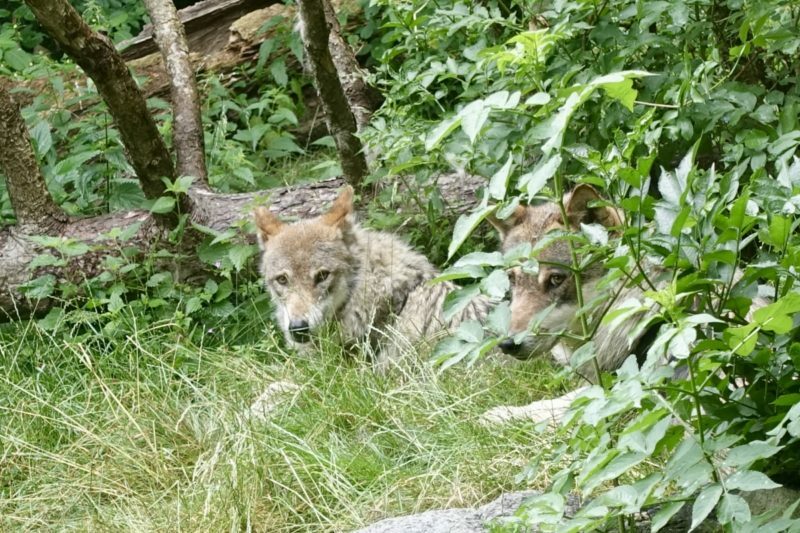 The zoo houses predominantly local and alpine animals. It’s a relatively small zoo, but still has some big animals on display. Our favourites were the bears and the elks, but we were also strangely captivated by the farmyard animals. A calf was surely only days old, and the geese were as I remember them from my childhood, grumpy and aggressive! They were wandering around uncaged, and I got a few swift pecks on my feet as I made my way past. Luckily my shoes where thick enough to not feel it. 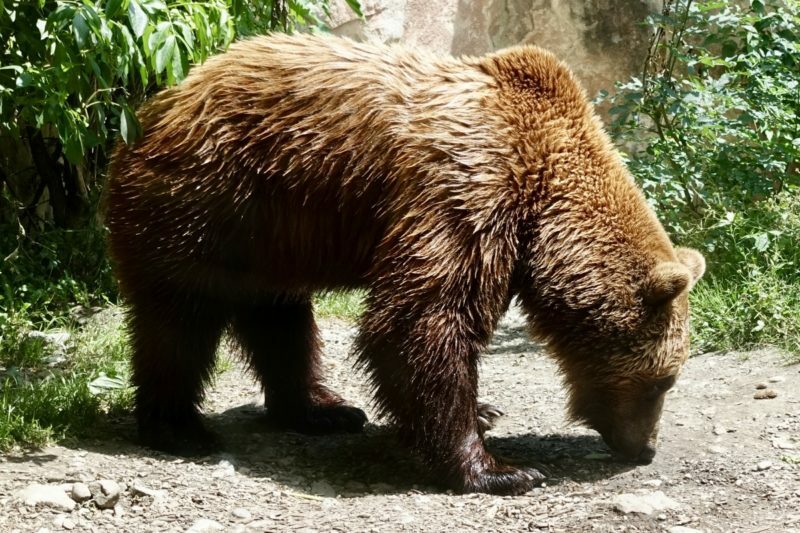 Bear at the zoo. There were two, and they were playing around with each other, it was great to watch. 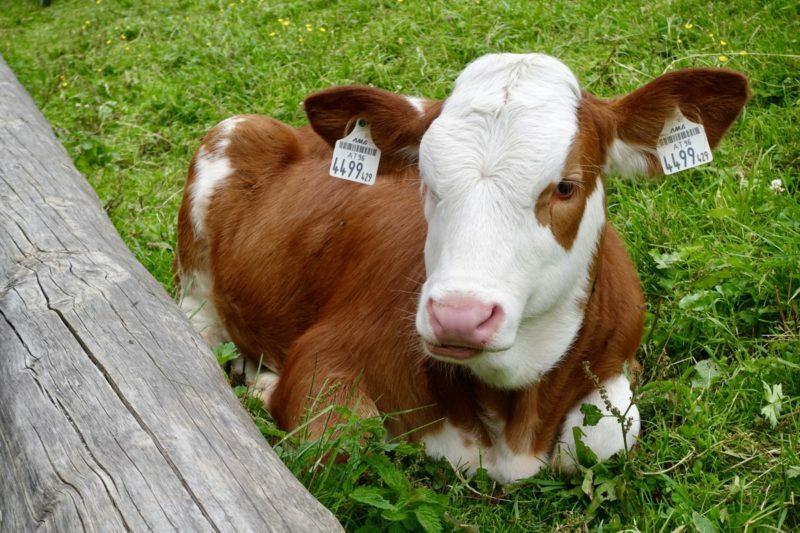 Awwww….doesn’t everyone love baby animals? 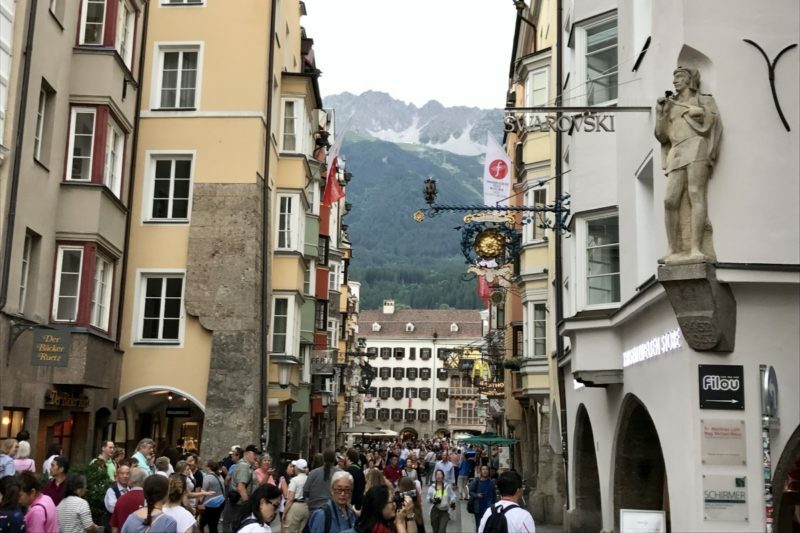 Back down in Innsbruck old town, we next got on the hop on hop off bus to do a lap around the main attractions in the city. Again, this was free with the Innsbruck Card. The commentary as we rode around on the bus was interesting, and really had us wishing we were not leaving early the next morning. There was so much more to do! 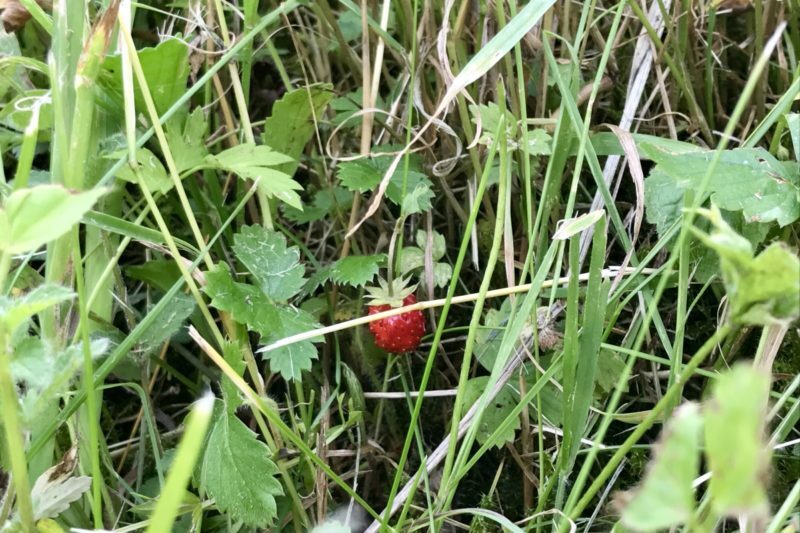 It was mid afternoon by now, so time for a snack! 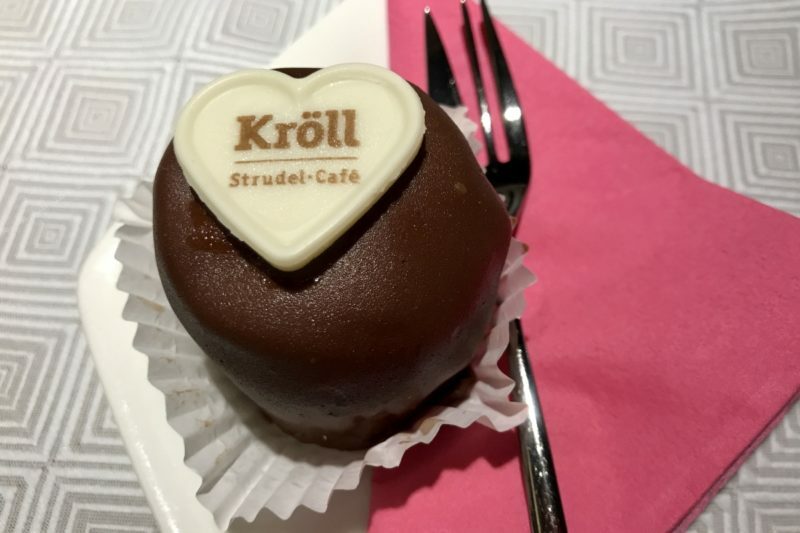 And what else should we try in Austria but strudel and sachertorte! Both were absolutely delicious, and if I wasn’t still recovering from my pizza and gelato binge of the last six weeks, I would have “tested” these many more times while in Austria. 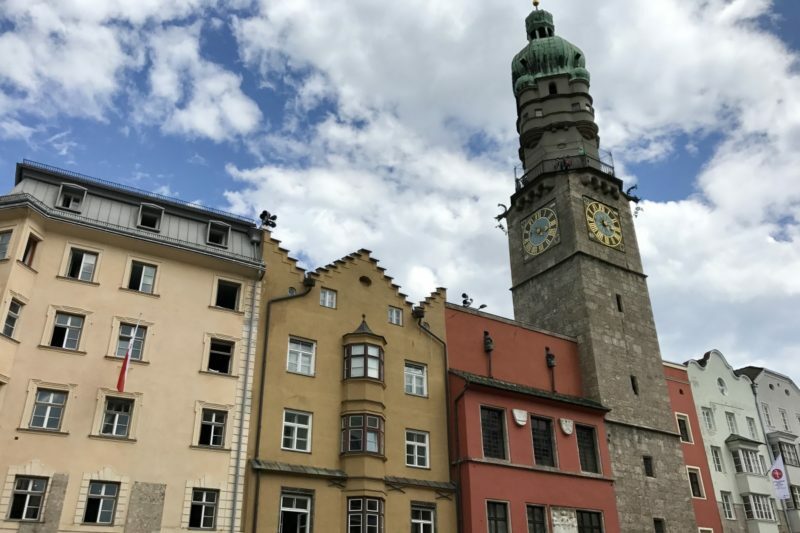 To wear off some of those calories, we climbed to the top of the Stadtturm, a tower in the middle of the Innsbruck old town. Again, this was free with the Innsbruck Card. From the top there are some lovely views over the city, with the mountains as a stunning backdrop. 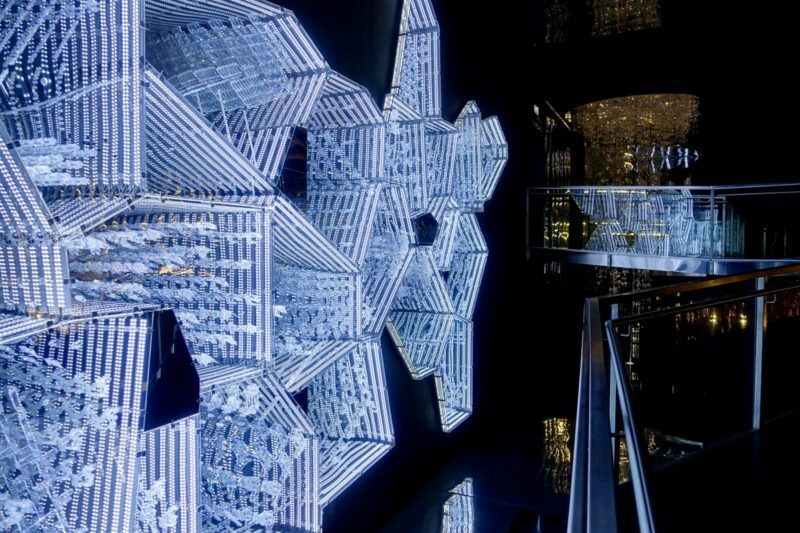 Our final attraction of the day was the Swarovski Crystal World. This is a little bit out of Innsbruck, but again, with the Innsbruck card, entry and bus transfers each way are free. I really wasn’t sure what expect here, and I doubt we would have gone if it wasn’t included as part of the Innsbruck Card. The first thing I noticed was the big outdoor park areas. 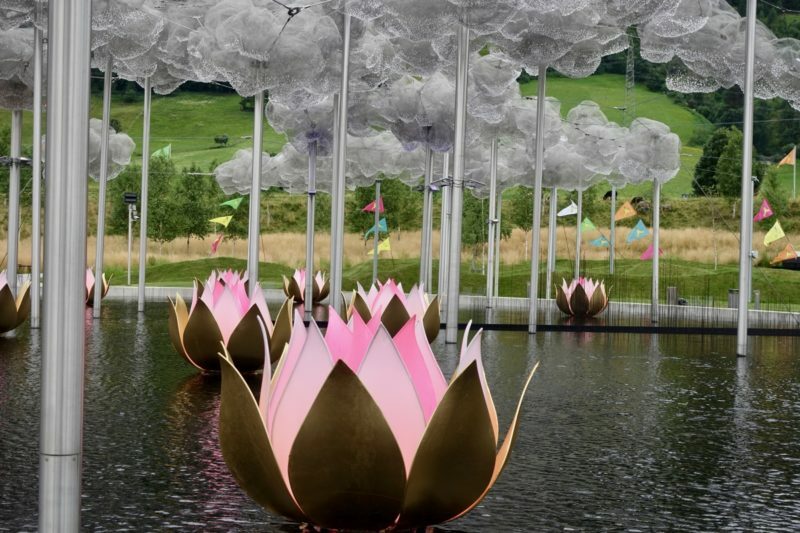 There is a crystal cloud forest and a waterfall face made of crystals. I also think maybe an Indian wedding or festival was being planned as there was a definite Indian theme to some temporary items that had been set up. There was also an Indian dance troupe that seemed to only be practicing, since they were just in street clothes. 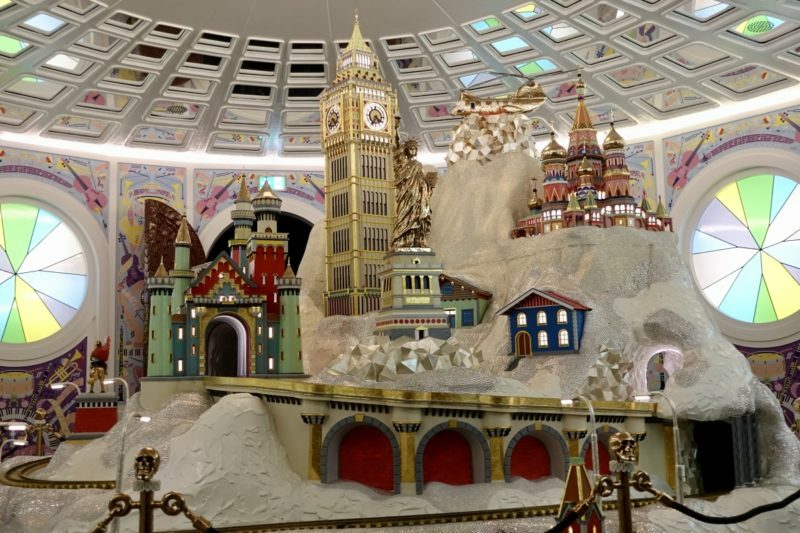 The main attraction is a huge pavilion with multiple rooms containing different artistic displays using or mimicking crystals. 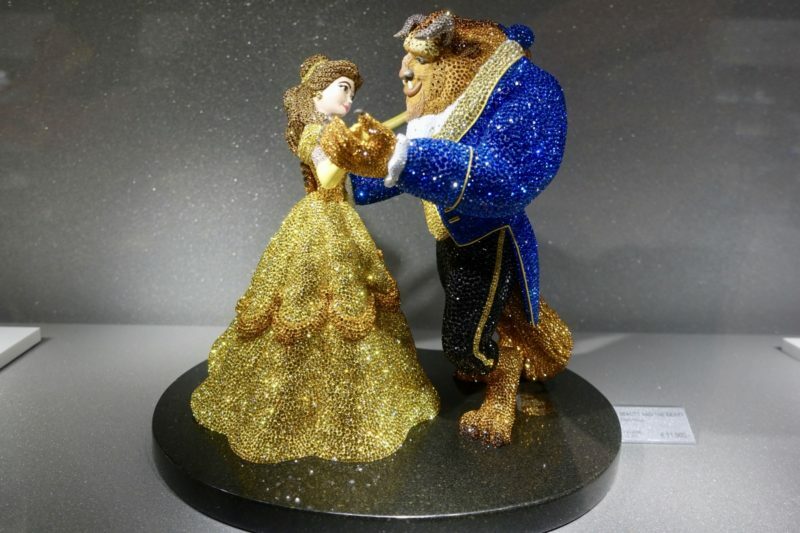 Beauty and the Beast, Swarovski style. Only €11,900. Early the next morning we were leaving Innsbruck on our way to Saalbach-Hinterglemm to meet up with my cousin Emma. Two trains and a bus later, we arrived in this little piece of paradise – and it’s raining! 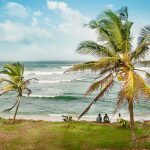 The weather had been stunning the week before, and Emma had sent me beautiful photos of the brilliant blue skies and emerald green hills. For the whole four days we were going to be there, rain was forecast. We were not going to let that stop us though! The first test of my conviction was only a couple of hours after our arrival. Emma had to ride about 5km into town to pick up her son. She asked if I wanted to go too. 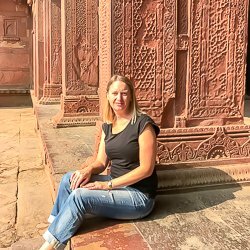 We had walked from the bus stop, uphill, to get to her apartment – I couldn’t imagine doing that on a bike. Apart from a few short trips to grab groceries when we were staying in Lierna a couple of weeks earlier, I hadn’t ridden a bike for years. I could probably count on two hands the amount of times I had been on a bike in the last twenty years. Emma assured me all would be okay because she had hired e-bikes. I had never heard of an e-bike before. I figured at first it must be some sort of environmentally friendly bike, but I couldn’t quite work out how that would help me ride. After an explanation of what an e-bike is, donning the wet weather gear, and a quick lesson, off we went! I was almost immediately in love! These bikes have a little electric motor in them. Not like the ones we see in Australia which have something like a lawnmower motor mounted on them and turn the bike into a noisy, simple “motorbike”. 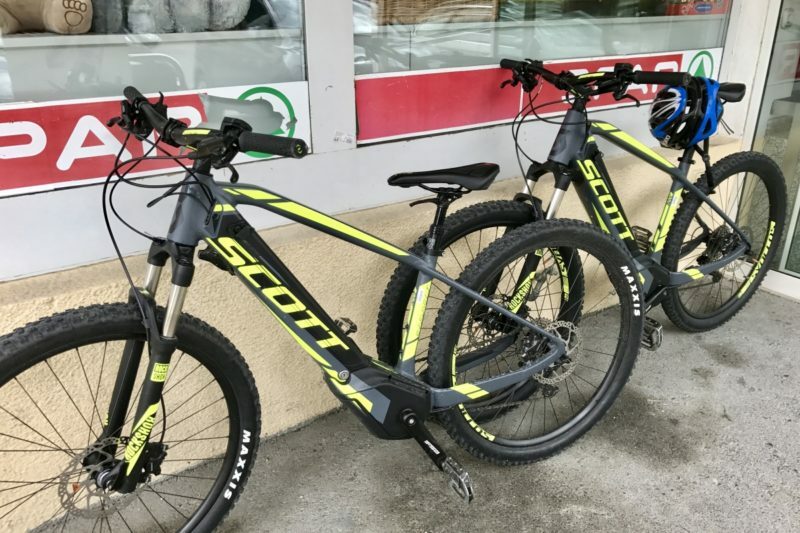 These bikes will not power themselves, but when you are pedalling they give a nice little boost, to make even going up the hardest hills bearable. They are also silent, so it’s like riding a normal bike, just easier in the hills. Saalbach-Hinterglemm is primarily a winter location. 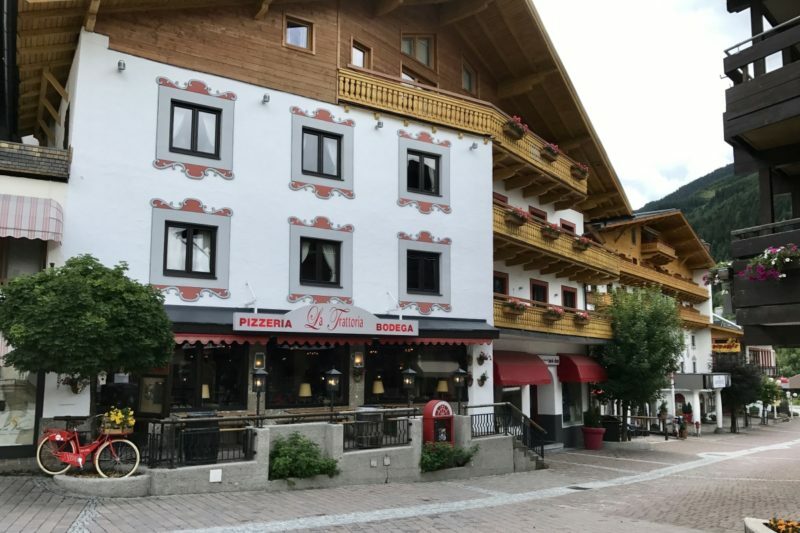 There are many ski lifts and gondolas in the area, and every second building is a hotel or hostel. 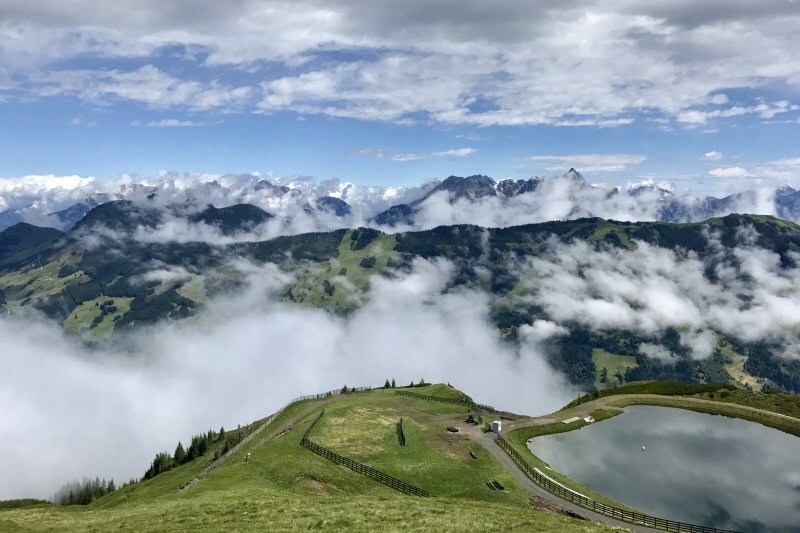 This summer, for the first time, the area has opened up some of the gondolas and is marketing the area as a summer holiday location too, for hiking, mountain biking and many other outdoor activities. 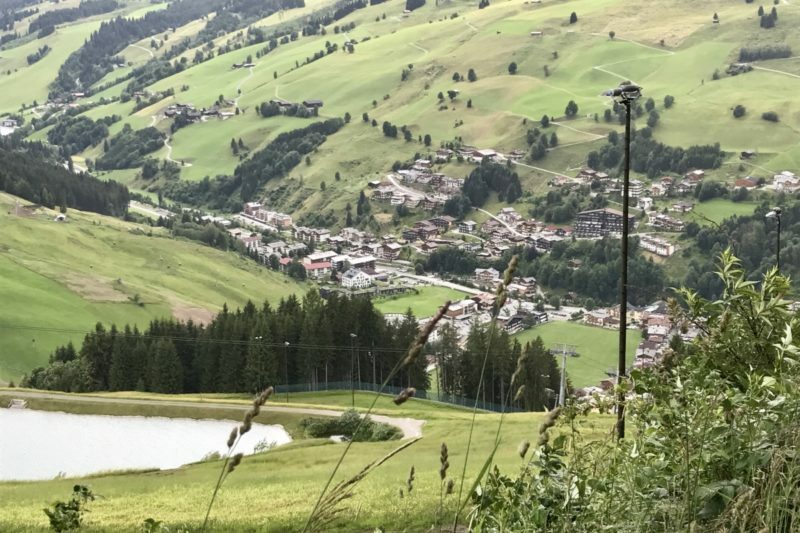 The next morning we got on the bus to Saalbach and took the Schattberg X-press gondola up to the top station at 2020m. We were crossing our fingers the weather would hold out for us, because we were going to do a 12km hike, ending up back down in Hinterglemm. As we went up in the gondola, we soon disappeared into the clouds. Just before the summit we emerged, and I was immediately in awe of the mountains again. The sun was out, it wasn’t too cold, in fact, perfect for a hike! From Schattberg we made our way across the hills to the next peak of Stemmerkogel (2123m). On the way we got to play in a little patch of snow again. Emma’s children were with us, so it was a nice little break before the last tough section up to the peak. We had a food and drink break at the top, and soon started our way down. Walking towards Stemmerkogl with patches of snow still on the ground. 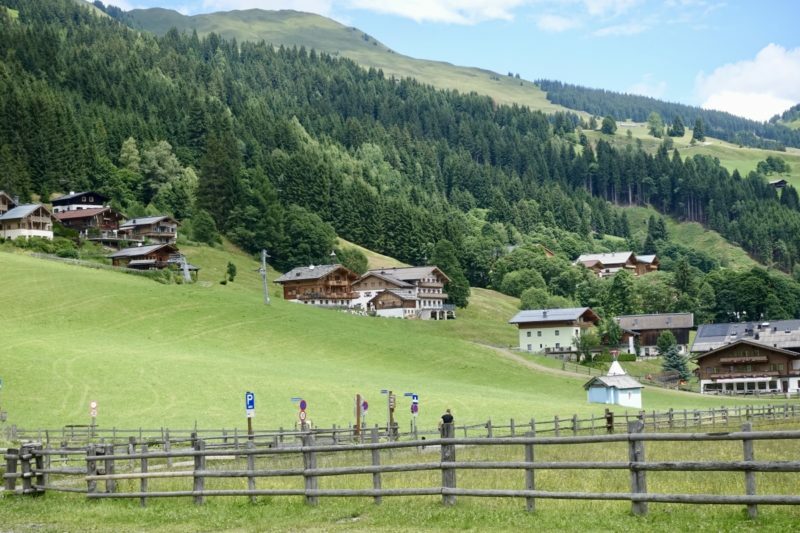 Our next break was at Hacklbergalm, one of many alms dotted through the alps for refreshments. I guess the best comparison for these would be a tavern, where food and drinks are served. I can imagine that the alms are welcome relief during the winter as a place to get out of the cold. 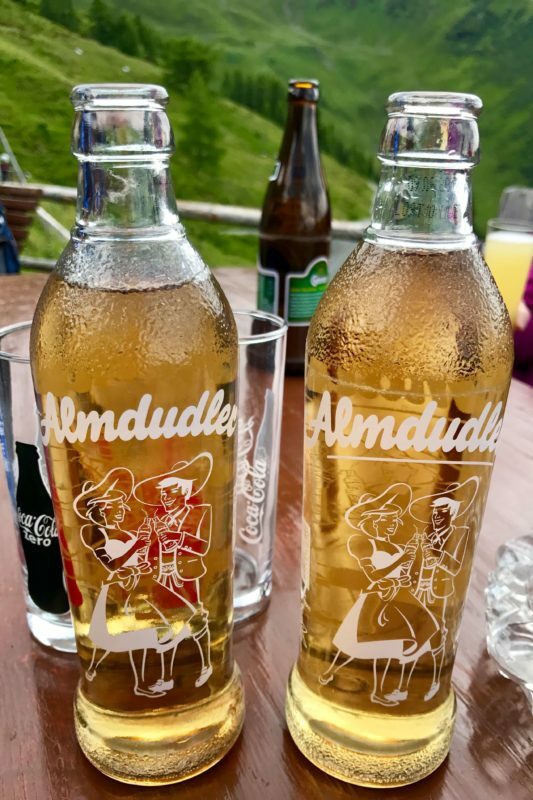 We, on the other hand, sat outside and admired the views, while I had my first taste of Almdudler, a homemade style of lemonade which seems to only be available in Austria (I may be wrong, but I haven’t seen it anywhere else!). 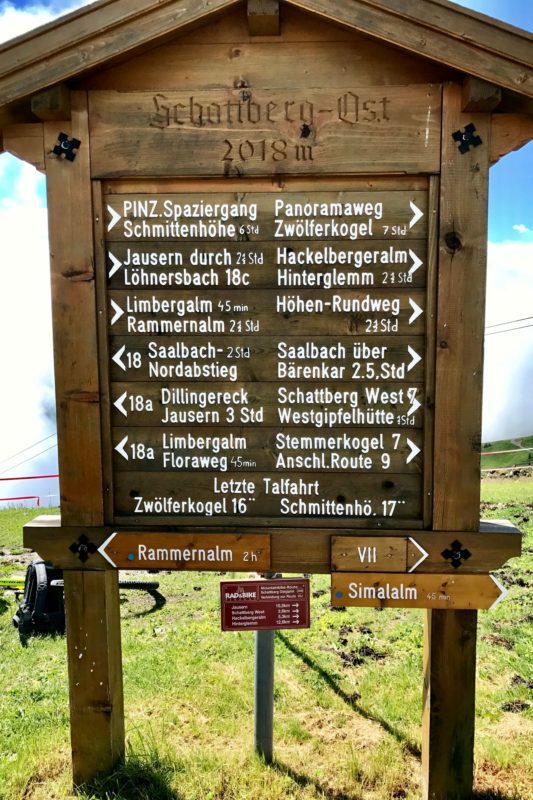 We were just making our way back into Hinterglemm when we felt the first drops of rain for the day. How lucky we had been as the rain set in for the rest of the afternoon as we stayed inside and kept warm and dry. The next morning we could all feel the extra work our legs had done the day before and it was steadily raining, so a late morning ensued. Eventually Simon and I jumped on the e-bikes in the guise of going to get some groceries, but we extended our ride to have a bit more of a look around. The area has great bike paths that are just to the side of the main road, so even inexperienced riders can feel secure not riding in the traffic. 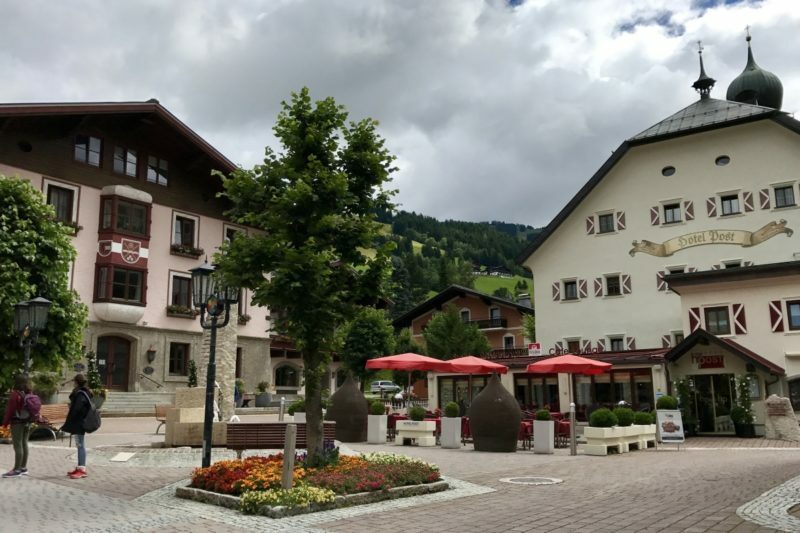 We rode into Saalbach town centre, and not surprisingly discovered it to be as picturesque as the rest of the valley. 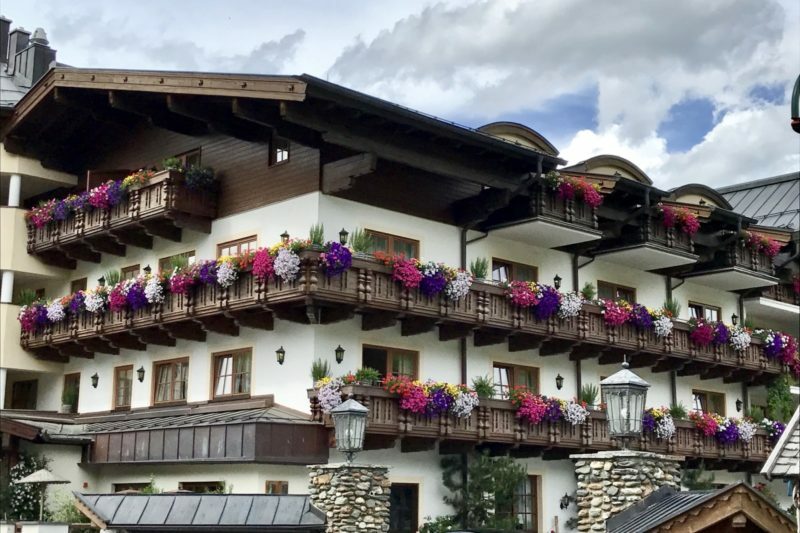 I loved how nearly every building was decorated with flowers in window boxes or on their balconies. The town really is built to cater for the tourist market, so there are lots of restaurants and hostels. Everywhere seemed to be open which was great, considering this is the first year the area has had a summer season. I was exited to see a Bookcrossing zone in the middle of town. 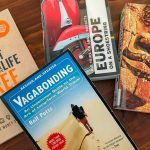 (Wondering what Bookcrossing is? 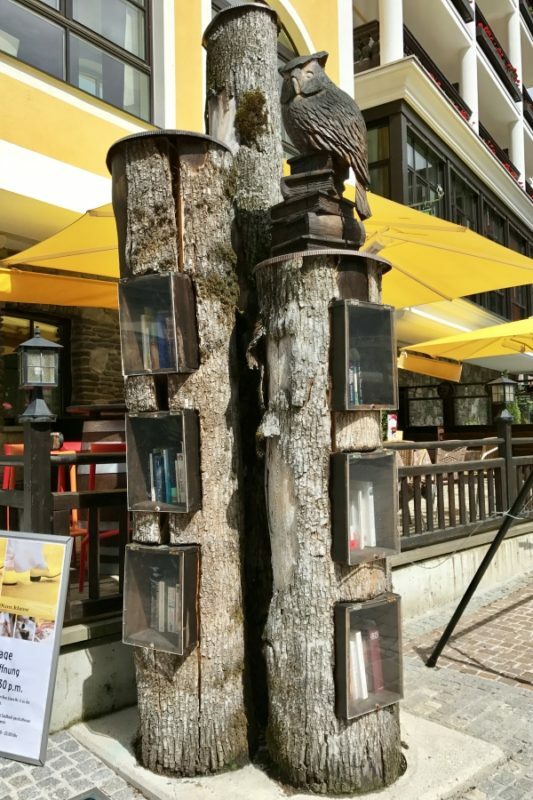 See my post here that talks about it) One of the hotels has built this fantastic weather proof book tree, so visitors can swap books during their travels. I didn’t have a book with me to leave there, but I did find a couple of books in English to take with me. I only had half a book left to read, so the timing was perfect! If you ever come across a Bookcrossing shelf, it is perfectly acceptable to take a book without adding one of your own. In the afternoon we all walked just up the road to Lengau. 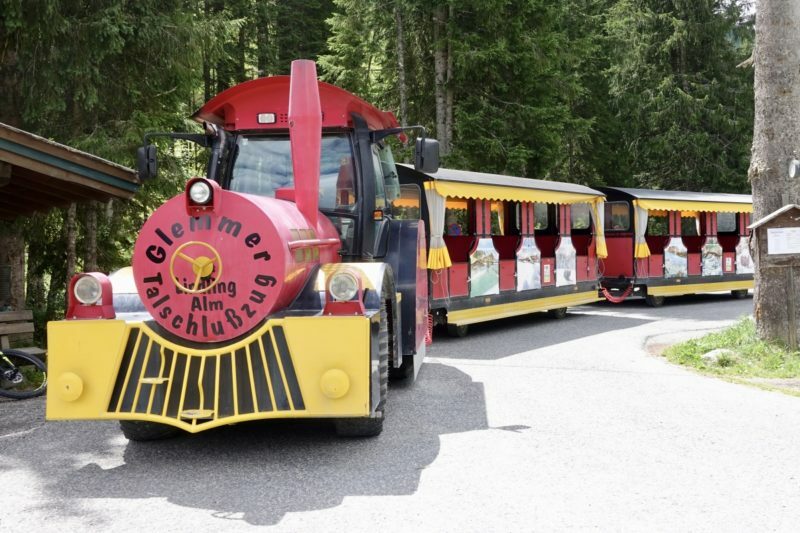 Here there is a little train made by a local farmer to take us to the Lindlingalm further up the valley. This is a fantastic area with hours of fun for everyone during the summer. 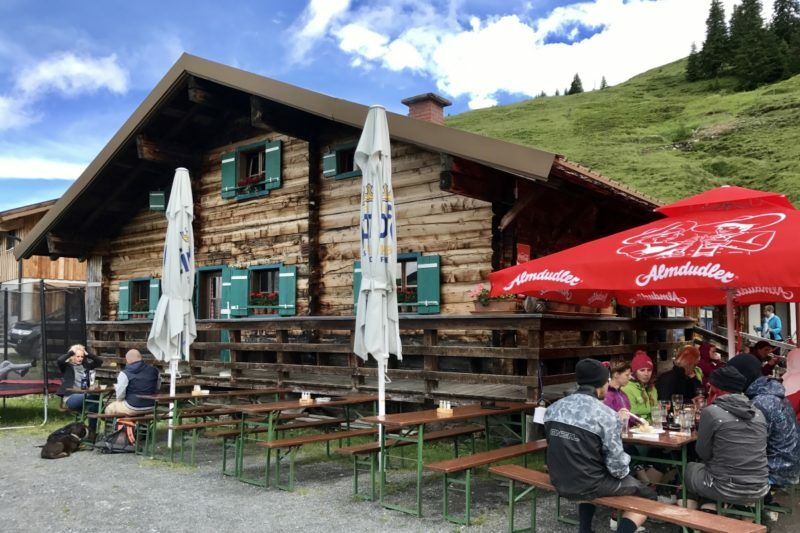 First we grabbed some lunch at the alm, warm goulash soup was only a few Euros a bowl. The kids soon made their way into Schnitz’s Playground, a fantastic area for all sorts of outdoor play. The playground has all been built by one man, each year he adds some more bits and pieces to it so it’s always changing. A small part of the rustic playground. I love that the tiny creek on the bottom right had lots of rubber duckies in it that the kids could race! Right next door is the Baumzipfelweg, a huge high rope park. Here there is everything to keep active kids busy for hours. The ziplines alone would satisfy most people, but there are also numerous ropes, swings and bridges of all sorts of difficulties. There is even a smaller course for the younger children. All safety equipment is provided, and before getting a chance to swing like Tarzan, there is a thorough training session with one of the instructors. 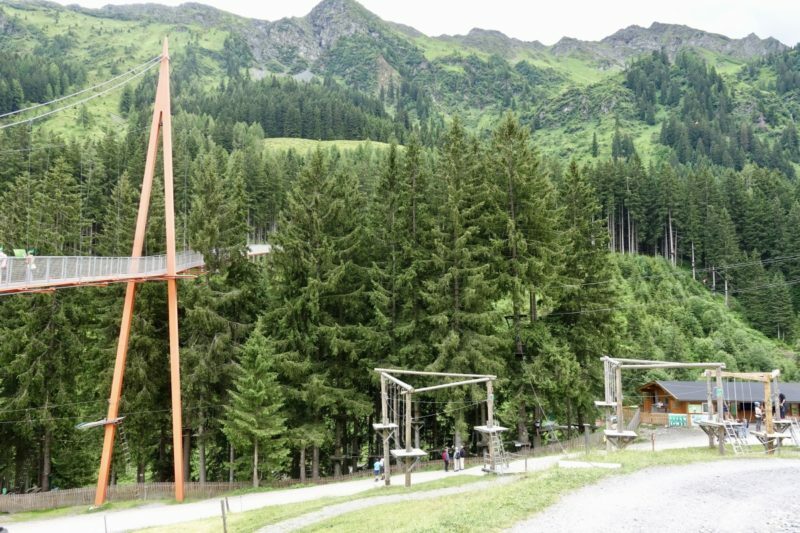 The training area of the high rope park, with a scenic bridge on the left. 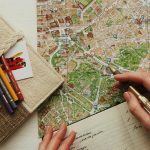 Of course here you are in the Pristine countryside, so there are many walking trails in the area that you can also tackle if you feel up to it. While we were there it was on the verge of raining the whole time so we didn’t venture too far. Instead we occupied ourselves with the baby animals roaming around, and browsing in the souvenir shop. Just as the rain started to come down, the farm train returned to take us back to Lengau. We weren’t looking forward to the walk home from there in the rain, but luckily it stopped long enough for us to hurry home and get inside before it started bucketing down again. The next day the rain had well and truly set in. The boys went off mountain biking for the day, and the rest of us stayed in and had a great day of Uno, battleships and triple dominoes. The rain cleared long enough for us to cook bratwurst on the outdoor grill, while enjoying some local beers and the stunning scenery. An absolutely fantastic few days in the mountains.